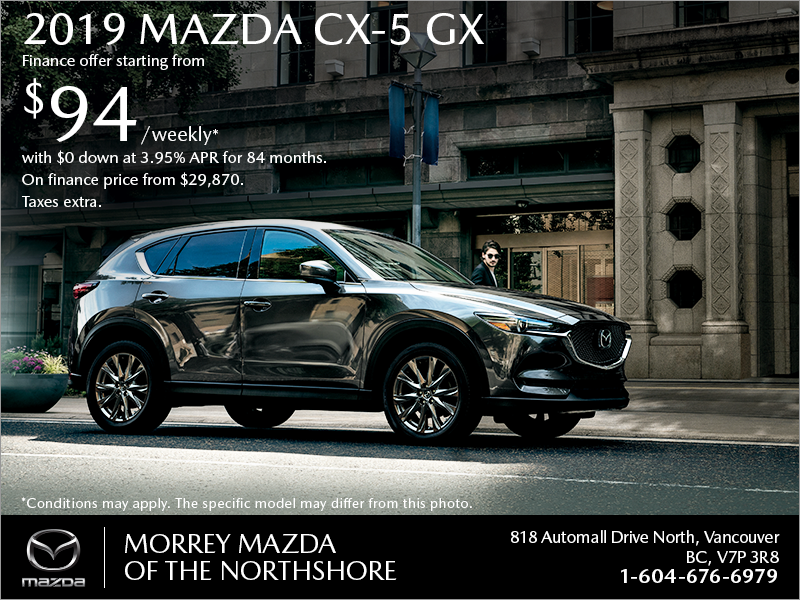 Morrey Mazda of the Northshore in North Vancouver | Get the 2019 Mazda CX-5 today! Home > Special Offers > Sales > Get the 2019 Mazda CX-5 today! 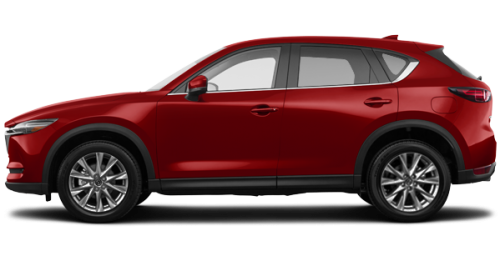 Get the 2019 Mazda CX-5 today! Finance the 2019 Mazda CX-5 GX starting from only $94 weekly for up to 84 months at 3.95% APR with $0 down. On finance price from $29,870. Taxes extra. Shift Into Spring Credit offer (value up to $1,000) is available to qualifying retail customers who cash purchase/finance/lease a select new, in-stock 2018 and 2019 Mazda model from an authorized Mazda dealer in Canada between April 2 – 30, 2019. Amounts vary by model: $300 on all 2018 Mazda3/Mazda3 Sport, on all 2019 CX-3 and on all 2018 & 2019 CX-5 models. $475 on 2019 MX-5 ST GS models. Maximum $1,000 on all 2018 MX-5 ST/MX-5 RF, on 2019 MX-5 ST GS-P & GT, on all 2019 MX-5 RF, on all 2018 Mazda6, on all 2018 & 2019 CX-9 models. Shift Into Spring Credit applied before taxes. Some conditions apply. NOTE: Shift Into Spring Credit offer not available on 2019 Mazda3 and 2019 Mazda6 models. See dealer for complete details. Based on a representative example using a finance price of $19,720/$23,120/$22,515/$29,870/$28,920/$38,720 for the 2019 Mazda3 GX (DVXK69AA00)/2019 Mazda3 Sport GX (SVXK69AA00)/2019 CX-3 GX (HVXK69AA00)/2019 CX-5 GX AT (NVXL89AA00)/2018 Mazda6 GS (G4SN88AA00)/2019 CX-9 GS (QVSM89AA00) at a rate of 3.85%/3.85%/2.99%/3.95%/1.49%/3.49% APR, the cost of borrowing for a 72/72/84/84/84/84-month term is $2,397/$2,810/$/$2,466/$4,368/$1,552/$4,978 weekly payment is $71/$83/$69/$94/$84/$120, total finance obligation is $22,117/$25,930/$24,981/$34,238/$30,472/$43,698. Taxes are extra and required at the time of purchase. As shown, price for 2019 Mazda3 GT (DVTN89AA00)/2019 Mazda3 Sport GT (SVTN69PR01)/2019 CX-3 GT (HXTK89AA00)/2019 CX-5 GT (NXTN89AA00)/2018 Mazda6 GT (G4TM88AA00)/2019 CX-9 GT (QXTM89AA00)/2018 MX-5 GT (L2TK68AAOO)/2018 MX-5 RF GT (L3TK68AA00) is $28,320/$30,520/$33,115/$39,920/$38,170/$50,970/$41,665/$44,665. License, insurance, taxes and down payment (where applicable) are extra and may be required at the time of purchase. Dealer may sell/lease for less. Dealer order/trade may be necessary on certain vehicles. Unless otherwise stated herein, offers valid April 2-30, 2019, while supplies last. Lease and finance on approved credit for qualified customers only. Offers subject to change without notice. Visit mazda.ca or see your dealer for complete details.